Josh Simpson operates the Ditch Witch SK755 mini skid steer loader. 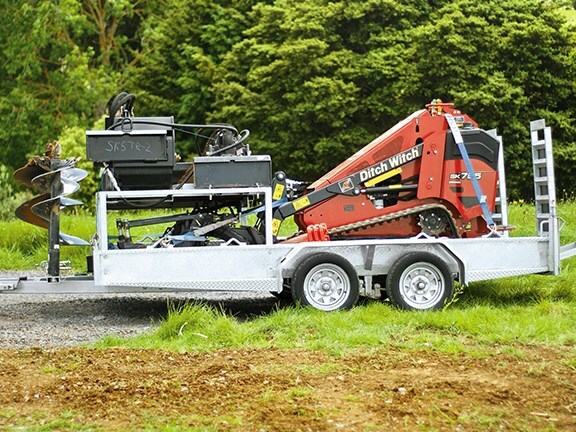 One trailer is all that was needed for the SK755 loader and its attachments. 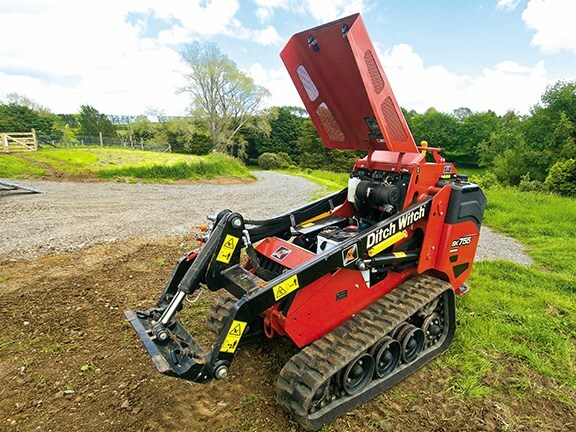 The trailer is designed to make changing the Ditch Witch SK755’s attachments relatively easy. A Kubota D1105-T 1.12-litre engine sits under the Ditch Witch SK755’s bonnet. 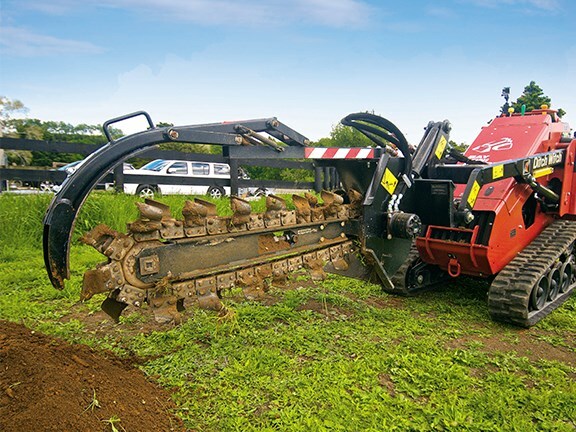 Using the trencher was made easy by using the mini skid steer loader’s foot-operated continuous flow option. Even the hydraulic system is designed to make life easier. Josh Simpson takes the Ditch Witch SK755 mini skid steer loader for a run and declares it to be one of the best-designed pieces of kit he’s operated. 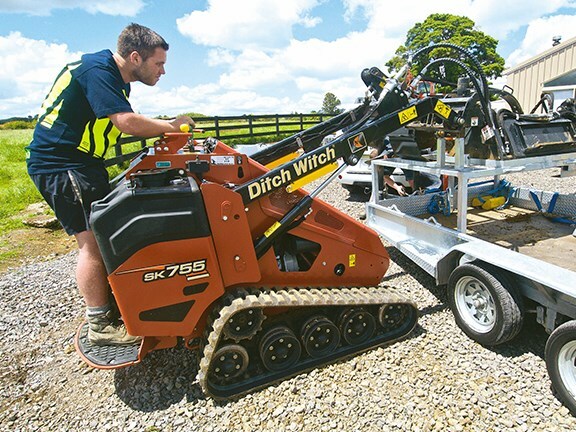 Mention the words ‘Ditch Witch’ and most of us tend to automatically think of a chain trencher for doing irrigation and the like. So I was asked if I wanted to test out the Ditch Witch SK755 mini skid steer loader, I was eager to see if it lived up to the trenchers’ well-earned reputation. Our test took place just South of Auckland on a small rural block. After being told that we were going to have a number of attachments to play with, I was expecting a transporter truck to turn up. So I was a bit surprised when just a ute and trailer came powering up the relatively steep gravel driveway. Looking at the setup on this trailer, it was clear a lot of thought and planning had gone into the design. It made use of every possible square inch to fit the attachments on, including using the draw bar to house the auger drills. The attachments on this setup consisted of a 4-in-1 bucket, an auger drill unit, a Harley rake and a chain trencher (because what would a Ditch Witch machine be without a chain trencher?). All these attachments were all placed to be easily accessible when on the trailer for ease and efficiency when swapping attachments on a job. 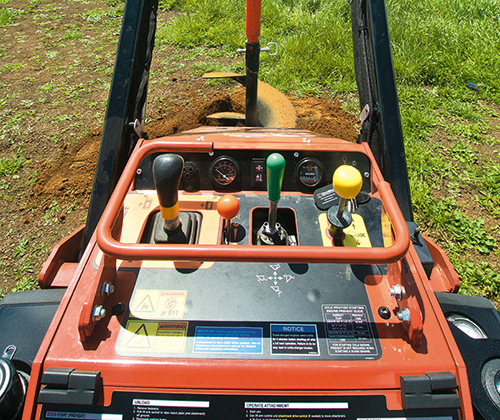 The Ditch Witch SK755’s controls are ergonomically placed and surrounded by a steel bracket. After taking the machine off the trailer, which was a straightforward process as one would expect, I started off with the usual walk around to see which features stood out. First were the wide tracks, which were accompanied by matching rollers – a good combination for lower ground pressure and stability. I also noticed that the sprockets were bolt-on, which would be of great benefit when doing maintenance, full cleaning or the eventual replacing. There also appeared to be a fair amount of ground clearance on the machine, which was reinforced after looking at the specs to see 226mm through the centre. Stepping up onto the operator platform, it was good to see that there was adequate space to plant my feet, which didn’t make me feel like I was standing on my toes. The front operating space had also been lined with support cushioning, which I’m sure would be a saviour after a full work day. Moving up to the controls, everything seemed to be ergonomically placed and they were surrounded by a steel bracket which made for a good place to rest my arms on while operating. There was also a cupholder moulded into the plastic hydraulic tank, which is always a good thing. Unclipping and lifting the bonnet uncovered a tidily set-out engine bay with everything in easy-to-reach areas for routine servicing and checking. The battery had an isolating switch for added security, which was nice to see. A back compartment also opened up to give access to the air filter and other components. Looking at the engine – which I should point out is a Kubota D1105-T 1.12-litre engine boasting a power rating of 32.8 horsepower (24.5kW) – showed once again how much thought has gone into this machine. The exhaust system has been designed to exit the side of the machine while at the same time directed away from the operator – a big plus, in my mind. 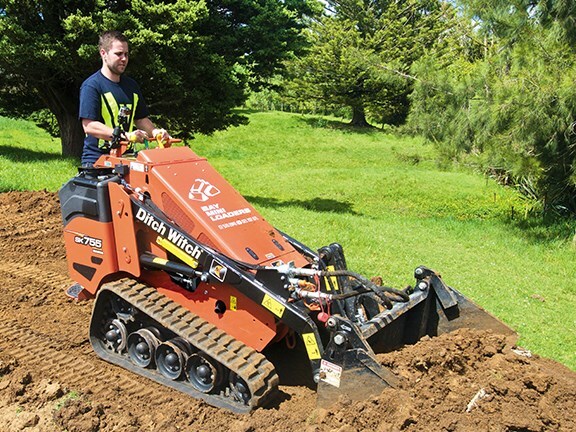 Ditch Witch is known for its trenchers, so it was no wonder this attachment exceeded expectations. Starting the machine up, I headed towards a pile of spoil to put the 4-in-1 bucket through its paces. I noticed straight away that I didn’t feel like I was being thrown around, nor was I having to hold on for dear life as I travelled across the uneven ground at the top speed of 7.6 km/h, which is a change compared to other mini loaders I have operated in the past. Pushing into the well-compacted stockpile was handled with ease and moving the machine around with a full bucket felt smooth and well balanced. I did, however, find the 4-in-1 bucket hard to use on the go as it is also controlled by hand; but this could be put down to my novice level of experience. Next up on the list was the Harley rake, which was swapped over with ease due to the connect pressure manifold. 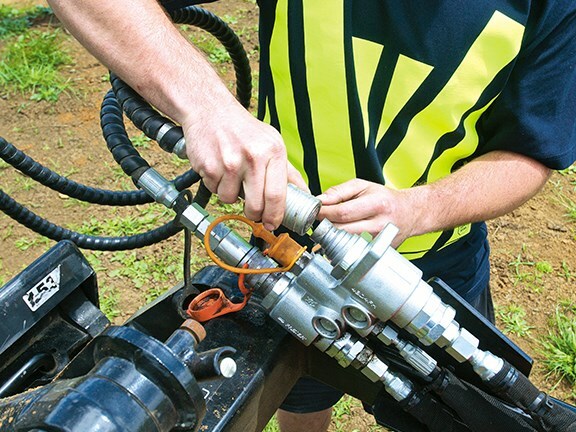 To put it in simple terms, this relieves any pressure on the auxiliary lines when connecting a new attachment, even when the machine is running at full power. The 52 litre-per-minute flow rate of the hydraulics handled the Harley rake with ease. Partnered with the float section on the lift arm, it followed the natural ground contour and made a first-time Harley rake user like me look like a seasoned pro. Next up was the auger drill unit which was accompanied with a 600mm drill and 1-metre extension. This turned out to be no match for the mini loader and can see this machine being a great unit for landscaping and fence contractors. 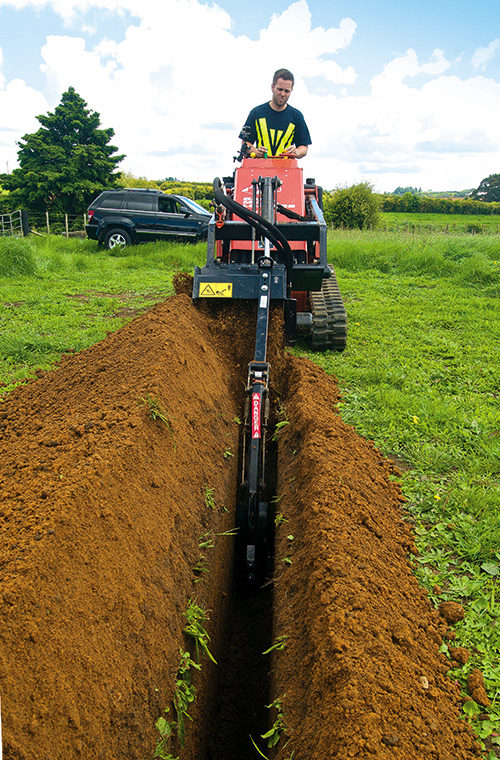 Last up was the chain trencher, and I was interested to see if it would live up to the Ditch Witch name. Unsurprisingly, it exceeded expectations and carved through the dense clay at a good, steady pace without giving any signs of struggle – very impressive considering the depth and density of the ground. Using this attachment was made easy by using the continuous flow option, operated by foot control, which allowed me to free my hands to control the speed at which the machine moved and also allowed me to adjust depth when required on the arm controls. After being on the machine for a considerable amount of time, it was evident that Ditch Witch has spent some long sessions at the drawing board. This has resulted in an efficient and practical piece of equipment which has proved it can tackle any task thrown at it.